Purchased a used Toyota Corolla from this dealer and it was not a pleasant experience! We dealt with a sales person by the name of Mike Stronach - he was absolutely painful to deal with - AVOID HIM AT ALL COST! The car we purchased had visible damage to one of the doors which we negotiated with the dealer/salesperson to have repaired. About 25 days after we took delivery of the vehicle the salesperson called to have us bring the vehicle in and have the door repaired. The repair was sub-standard so we did not accept it as it was done. It was a fight to have them attempt to repair the damage again - this time the repair made the damage much worse. When I informed the salesperson (MIKE STRONACH) of this he blamed me saying it was my fault because I wasnt satisfied with the quality of the first repair and I should have just accepted it the way it was - which was sub-standard. I told him this was unacceptable and the door would need to be repaired by a properly trained individual or completely replaced. After waiting a few days they obliged as this was a condition of the transaction. So we had to drop our car off for a 3rd time now to have what should have been repaired properly the first time. Finally the repair was done properly. Probably the most shocking and discouraging thing about this transaction with Mike Stronach and North Bay Toyota was the way the vehicle was advertised on the North Bay Toyota website. It was advertised as a certified used vehicle which included the first oil change free. Right after handing the check over to the salesperson we asked about that oil change and were told immediately that this particular vehicle didnt qualify for that offer. No explanation was given at that time but I figured who cares, its only $50. After owning the vehicle for 3 months we received some information in the mail from Toyota about the Certified Used Vehicle Program and this information stated that we were indeed entitled to a free oil change. After addressing this with Toyota head office they said they would reach out to the dealer to determine what happened. When Toyota head office reached out to the salesperson he said that we were mistaken and he never said we werent entitled to the free oil change as advertised, as per Toyota Canada head office. So Mike Stronach lied and was not truthful about this. I would avoid dealing with this salesperson at all cost. After all these problems, the GM or the dealer principal couldnt be bothered to reach out to me. Based on this terrible experience I wont even set foot in this dealership again....I wouldnt recommend them. Buy your Toyota anywhere else but here. 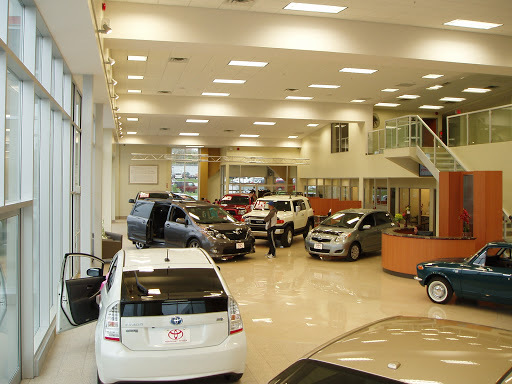 We have been happy, loyal North Bay Toyota customers through many years, and many Toyota vehicles. Recently, we were treated to service which was above and beyond the already high level we have always enjoyed. With two young kids and a puppy on board, the puppy left us a prize in the back seat of our Rav4. With no appointment and no notice, we showed up in a crisis. Without hesitation, the service counter staff co-ordinated damage control and and had our car cleaned up and back on the road in no time. Clearly, loyalty is a two way street. August 2015 Brought my 2009 Corolla in for an Alternator Change, 3 hours later, like they had predicted it would take, they called me about having to change my water pump which I said yes and again as predicted the job was done on time. Shuttle brought me back to North Bays Toyota. Paid the bill and as I walked towards my cleaned car I noticed that the hubcap on the back the drivers was missing. They ordered one and going to pick it up this afternoon at no charge. Thank you to North Bay Toyotas GM Myers. Was rude to my parents, when asked how their product When my parents asked for a price on a car they would not even tell them the price without purchasing it first. Actually said "if there is no money on the table there is nothing to talk about." Unprofessional and arrogant. Bought a brand new Jetta instead of dealing with these bullies. Will spread the word do people do not go to this Toyota dealer. I just bought my brand new RAV4 SE from North Bay Toyota. From start to finish the service was more than excellent. I had great help from the best sales guy there - Leo Vaserbakh. The general manager Paul Meyers and Dawn Moffat in finance were very friendly and a great help. Also, a very special thank you to Tim Falconi, dealer principal. The free car washes are amazing!!!!! !